With subtle updates to the exterior styling, enhanced infotainment, new safety features and engine upgrades, the 2017 facelifted Golf continues Volkswagen's tradition of quality and value for money. From 8 models and 14 engine sizes to choose from you will be amazed at how much choice you have. Various light designs and wheel and tyre combinations allow you to make your new Golf unique to you. The new Golf's exterior boasts a striking, confident appearance like every generation of the Golf – from the newly designed headlights and bumpers and a dynamic radiator. Inside, space meets comfort, meets quality, meets new technologies. All of this awaits you inside the new Golf – with a single goal: to make every journey as relaxed as possible. Intelligent driver assistance systems such as Enhanced Park Assist 3.0, Blind Spot Sensor and Front Assist increase driving comfort, helping you to manage or avoid critical situations. The Infotainment systems in the new Golf meet the highest demands, with its standard touchscreen and gesture control (part of the optional Discover Navigation Pro).Look forward to the comfort of the wireless charging function for your smartphone (optional) and the flexible display on the digital dashboard. The optional DYNAUDIO Excite sound system is specially designed for the acoustics of your car’s interior, delivering sound to surpass the expectations of even the most discerning audiophile. 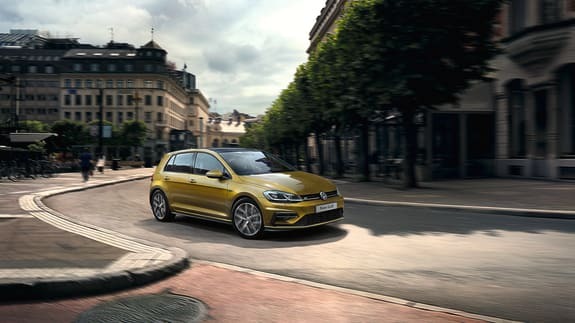 We would be delighted to show you the new Golf in closer detail and accompany you on a test drive. To make your appointment, simply complete our Online Contact Form –or phone to arrange an appointment.